Have you ever heard of a “pendulum“? It’s an instrument that is used by some people to locate ground water or to visualize invisible forces. Also it can look very pretty and make a decorative piece of jewelry or ornament. 🙂 I wanted to do a small woodworking project again, and as I needed a “magic present” for a spiritual friend, i decided to make a wooden pendulum. It worked out so well, that I made a couple more and did a tutorial for you guys. I hope you enjoy! 1. You can use various types of wood for this project. Some believe that certain types of wood are better for special kind of tasks then others. If you want, you can choose the wood accordingly. I used mostly willow twigs. The important thing is, that your twigs should be as straight as possible and dry. Use twigs that are not too freshly cut. 2. First thing I removed the bark with sandpaper. It works really well if you use one with a rougher one first and then move on to a fine one. If you make a couple of pendula a belt sander can come in handy. I secured an old one upside down on my work bench. Try to straighten out the twig as much as possible when you remove the bark. A belt sander is faster but you are prone to more mistakes. 3. Sharpen the twig roughly from four sides. It’s important that you stop to check every couple of seconds if all the sides are even. 4. After that you smooth out the edges and try to round it as evenly as possible. It works best if you make rolling movement with your twig over the sandpaper. This step took me the longest of all. Often the tip will get wonky and you have to even it out again. You have to sacrifice a lot of your twig if you do that, so it’s better to start out with a longer one. It’s especially hard with a belt sander, because small corrections are nearly impossible. If you apply a little to much pressure, half of your tip is gone. I cut out a lot of the video sequence. This step took about 4 minutes. 5. If you are satisfied with the tip you can cut off the desired length for your pendulum. Use a fine saw to get a smooth cut. 6. If you like the way it looks now, you could leave it at that. I wanted a rounded end on my pendulum, so I worked it with sandpaper again. This is very hard to do with a belt sander, because the pendulum is too small to hold it securely. I sent more than one piece flying through the workshop. Rotate your pendulum carefully while you are sanding it. Make a circular movement to achieve an evenly rounded end. 8. You don’t have to decorate your pendulum if you don’t want to. A thin coating of varnish or beeswax will do. I used a woodburning tool (available here*) with a fine tip to draw small symbols and patterns on the wood. 9. It is easiest if you map out your pattern lightly. For this the tip of the woodburning tool should hardly touch the wood. (Or use a pencil.) It is possible to correct small mistakes at this point. Tip: Use a sharp razor blade to take off thin portions of the wood if you made a mistake. 10. Once you are satisfied, you can draw your pattern for real. Try to apply no pressure with the woodburning tool. It takes a bit of practice to get the hang of that. I made a video of myself decorating one pendulum. The speed is increased. This took me about 8 minutes. 12. This is a small selection of the pendula I made. I tried different patterns and techniques. You can see that some of the lines are not as dark as the others. That is because the woodburning tool was not hot enough. I corrected that later. 13. You’ll need to be able to attach the pendulum to a string of some sort. So I drilled a little hole first. 14. I wanted to be able to exchange the string later on, so I decided on an eye bolt. You can apply a drop of wood glue before you secure the bolt. You don’t have to drill a hole, but it is easier to screw in the bolt later if you do. And that is the finished pendulum! 🙂 The string should be as long as your underarm. I like rustic decorations, so I made some wooden beads out of thin twigs. If you are interested, you can find the tutorial for that here. I also made the little goddess pendant myself. 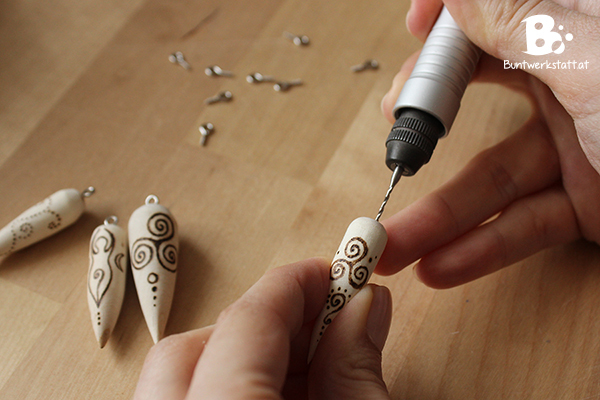 It’s made of polymer clay and can also be used as a pendulum. I will write a tutorial for that in the next couple of days. It really is amazing work and I want to give it a try. Not sure if it will look as amazing as yours but I will give it a go!